– Lesson #1: Salt. 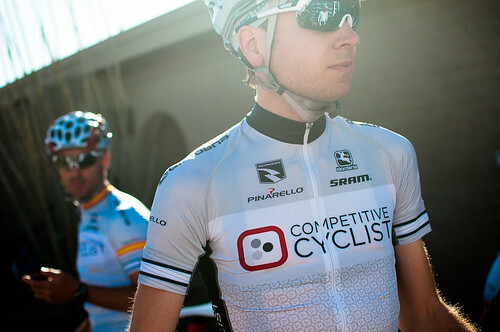 One of the most promising signings for the Competitive Cyclist Pro Racing Team is Max Jenkins. He spent the last two years with United Healthcare, including a lengthy spell over in Europe during 2011. We chatted about how he kicked off his season last year. From the chilliness of his hometown near Sacramento he went straight to the tropical heat of the Tour of Langkawi. He explained that from the outset of the race, cramping was a big problem for the team. So the soigneurs tracked down a local solution: Pink Himalayan sea salt. Whether it was due to a difference in electrolytes or something else with its nutritional make-up, he said it made a night-and-day difference. I’d never heard of it before, and I’ll confess that I raised my eyebrows a bit in hearing about magical concoctions discovered on the UCI Asian Tour. So I was more than a little surprised when Max told me that Trader Joe’s sells it, and now he uses it every day while cooking. Last year on a riding trip to Spain I made the discovery of Sal de Ibiza and it’s been my go-to salt since. Max’s salt tip was the revelation of the camp. New horizons await. And even if I abandon that one bit of Spain forever, I’ll make up for it with a new Spanish discovery. The La Fuga Travel blog is a Gironan Fantasy. – Lesson #2: Become open minded about cars. No type of automobile makes a cyclist weaker in the knees than a wagon. A well-done wagon will have the punch needed for that rally car event known as the race caravan. Yet it’ll have storage far more copious than any sedan. For most bike racers I know, wagon lust comes second only to bike lust. The wagon honor roll is long but imperfect. The Audi A6 Avant is the dream, but it’s no longer sold in the United States and, when it was, it just too damned expensive for a rolling bike locker. There is the smaller A4 version, although pride makes it hard to stomach the idea of settling for it over the mouthwatering A6. The Subaru Outback seems too granola, while the Impreza WRX is too small, as is the Volkswagen Jetta Sportwagon. The Acura TSX has plenty of upside, but it swooping rear design cuts into the cargo space. 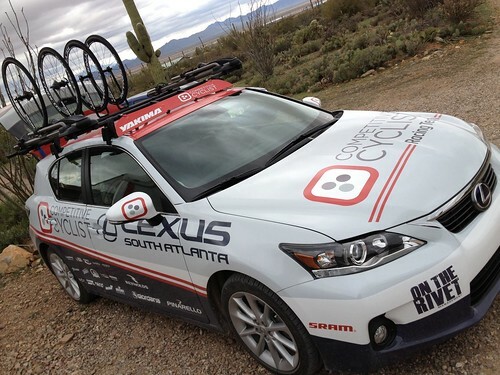 Which then brings us to the official car of the Competitive Cyclist Racing Team, the Lexus CT 200h. Oh, how it torments me. While it’s bigger than the WRX, it’s smaller than the A6. But it’s a size I can live with, especially since it costs half of what Audi last asked for the A6. And I smolder seeing it wrapped in our team colors. That being said, I’m a crazy fan of journalist Dan Neil’s writing about cars. His poetic articles about Porsche, for example, are akin to Danielle Steele waxing rhapsodic about heart shaped hot tubs. And that’s where my worry resides. He was more bored than thrilled by the Lexus, to put it lightly. But while the Lexus wasn’t sporty enough or fast enough for Neil’s liking, watching our Team DS Gord Fraser rail it on the backroads around Tucson reminded me how the quality of the driver goes a long way in offsetting any car’s limitations. I couldn’t connect the dots between what I saw at camp and what I read in Neil’s article. I arrived in Tucson with some long-held skepticism about the Lexus (Neil’s article is from last July), but I left a whole lot less skeptical. The front wheel drive of the Lexus can be affordably overcome by snow tires in wintertime. And despite the smug vibe of hybrids as a whole, we can probably counteract some of that fuel economy and environmental goodness with lots of hard acceleration and braking. 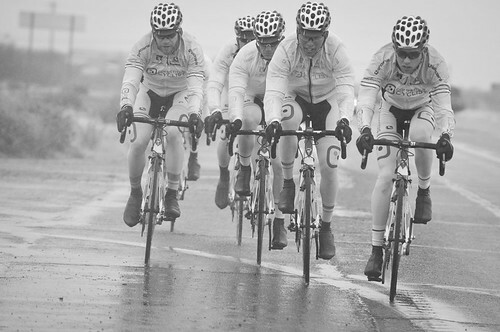 – Lesson #3: The Domestique. How do you become a pro bike racer? By winning a ton of amateur races. There’s no other way, which makes it fascinating to observe which pros can handle accepting a role as a domestique, the job which awaits most of them, of course. The thornier issue is who will embrace the role and who will struggle with it. 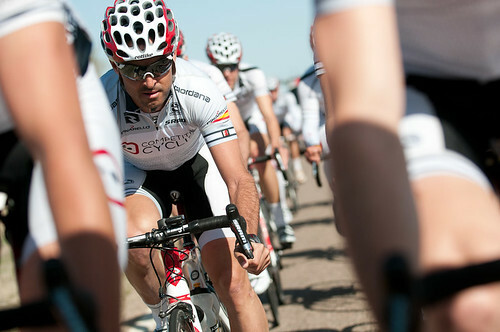 In riding with the team in Tucson I enjoyed my time in the paceline alongside the team stars. But even better was my time with the foot soldiers. It was inspiring to hear a few of our young pros proclaim, with absolute enthusiasm and sincerity, their willingness to rip themselves apart for the sake of the team. And, of course, on every team there are a couple of riders who aren’t so polished on the topic. They have a lot to learn, and they face the longest odds in taking their next step as a pro. – Lesson #4: The Pinarello Dogma 2. Oh man. I’ll admit that the frame weight of the Dogma 2 was something I’ve always choked on a bit. It’s about 150g heavier than 800g superframes like the Wilier Zero.7. But then I went to camp and rode one with SRAM Red and a nice set of Reynolds race wheels. Even with bottle cages and Look pedals it was 15 lbs. It felt like lifting a box of Kleenex. In exchange for its imperceptible weight penalty you get a frame with industrial-strength drivetrain stiffness. It rails corners like a slot car, it’s a control-freak’s dream on descents and it has measurably superior durability. There is zero sacrifice with a Dogma 2. – The oldest rider on the team is Mike Olheiser . He looks all-but-homeless thanks to his emaciated physique and scraggly Special Forces-style beard. Nothing indicates that he’s won umpteen national road championships plus a couple of Master’s Worlds titles. 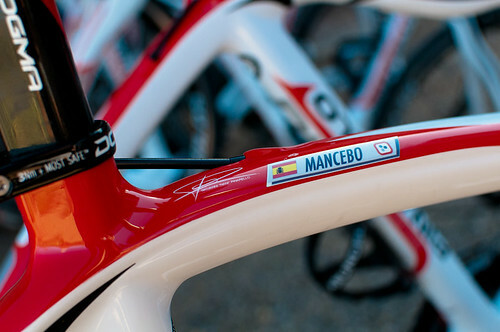 And that’s probably why the pack let him roll off the front on his Dogma 2 after a KOM, ultimately to win the first stage of the Rutas de America, also known as the Tour of Uruguay. Yet all glory is fleeting. In the time trial stage later in the week Mike took a corner too fast and crashed himself out. Another friend with a tough stay in a hospital. Get well soon Mike. The team misses you. – Lesson #5: Promiscuous riding is the best riding. Nothing is so sweet as new roads and new roadside terrain. Nothing is so sweet as new people to ride with and the new mid-ride conversations that come with them. A change of scenery makes the cyclist’s heart sing. Tucson, thanks for the fling.